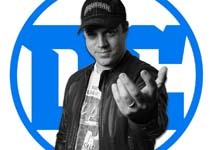 Geoff Johns is launching Mad Ghost Productions and is entering into an exclusive writer/producer deal with Warner Bros. and DC Entertainment to create content across multiple divisions of the Studio, including films, television and comic books, based on current DC properties as well as new and reimagined IP. As part of this deal, he will exit from his executive post as president and chief creative officer of DC Entertainment to focus on creative matters full-time. DC Entertainment publisher Jim Lee will expand his role to include the chief creative officer title and responsibilities, and will continue to act as Publisher together with Dan DiDio as they have since 2010. These announcements were made today by Thomas Gewecke, chief digital officer and executive vice president, strategy and business development, who is serving as DC's interim head. Johns' publishing projects will include a new pop-up slate of comic books focusing on new and lesser known DC characters and titles. Johns will also be writing a Shazam! comic book series scheduled to be out in the fall. In addition, he will continue to write Doomsday Clock, as well as the upcoming Three Jokers, illustrated by Jason Fabok. Johns will executive produce and write the Green Lantern Corps movie, which will be based on Johns' Green Lantern comic book run, and will executive produce Wonder Woman 2. "Geoff is a super talented writer and truly embedded in the DC Universe and its characters," said Toby Emmerich, chairman, Warner Bros. Pictures. "We're thrilled that he's returning to his passion and his roots as a writer and producer. And, it's even better that he's staying in our Warner Bros. family. We look forward to working with him on Green Lantern and other projects going forward." "I took on a role at DCE because I love the characters and this universe more than anything," Johns said. "But, I want to spend my days writing and on set. I'm thrilled to get back to a more hands-on creative role. It's a dream job on dream projects, reaching even deeper into DC's vast pantheon of characters. I'm also excited to continue to work with the amazing team at DCE and my colleagues at Warner Bros."
Marvel Comics has released the cover to Tony Stark Iron Man #4, in stores on Sept. 19. "Tony Stark is kicking off an all-new adventure this summer with the superstar creative team of Dan Slott and Valerio Schiti -- but this fall, it's an old relationship that takes the stage, as Tony rekindles his relationship with the one, the only...Janet Van Dyne! "How will Iron Man and The Wasp's relationship be rekindled? Find out in Tony Stark Iron Man #4." The cover is by Alexander Lozano. AMAZING ANNUAL: Marvel announced a Sept. 19 release for Amazing Spider-Man Annual #1, written by Saladin Ahmed, with art by Garry Brown and a cover by Aco. "The two creators weave a tale of mystery, tension and drama as they answer the question everyone wants to know: just what was the symbiote doing with Peter during those secretive nighttime excursions?" "Amazing Spider-Man Annual is an untold street-level story of the brief bond that existed between Pete and the alien symbiote that would eventually become Venom," said Ahmed. "This is my tribute to the Spider-Man I grew up reading in the early 1980s -- the messed up and confused Peter Parker who came back from an alien world with a new costume and new problems as Gang Wars tore through the streets of Manhattan. That era of Marvel storytelling had a profound influence on me, and it's an absolute thrill to come back to it by writing Marvel's most iconic hero. Walking this line between nostalgia and a modern story requires a really skilled artist, and Garry has knocked it out of the park on that front. His work has all the pulpy excitement of the Bronze Age without wallowing in the past. Spider-fans are going to love this book!" CAPTAIN MARVEL COVER: Marvel also released Joe Quesada's variant cover for The Life of Captain Marvel #3, in stores on Sept. 19. "The understanding of Carol as a hero is fundamentally tied to her strength, but being strong is not entirely the same as having Kree powers," writer Margaret Stohl said. "So it's been a really interesting journey looking into the nature of Carol's strength; what makes her strong as a person and as a hero? Where is that all coming from?" For covers and five-page previews of Dynamite Entertainment titles arriving in stores on Wednesday, June 13, click on the cover thumbnails or the links below for the individual titles. For covers and five-page previews of DC Comics titles arriving in stores on Wednesday, June 13, click on the cover thumbnails above or the links below for the individual titles. Look for more DC previews soon here in The Continuum. For covers and five- to 10-page previews of Archie Comics titles arriving in stores on Wednesday, June 6, click on the cover thumbnails or the links below for the individual titles. * ARCHIE AND ME COMICS DIGEST #8. * B&V FRIENDS JUMBO COMICS DIGEST #262. * BETTY & VERONICA: VIXENS #7. SUPERMANSION SPECIAL: Sony Crackle has announced a Thursday, August 18 premiere for SuperMansion: Summer Vacation Special. "The team heads to Hawaii where Titanium Rex (Bryan Cranston) runs into a vacationing former President Barack Obama (Jay Pharoah), Black Saturn (Tucker Gilmore) and Lex (Jillian Bell) teach Cooch (Heidi Gardner) how to swim, and American Ranger (Keegan-Michael Key) attempts to perform in a USO show while an evil threat brews under the sea." Additional new episodes of Season 3 return this fall, featuring Minnie Driver joining the cast in a recurring role as Debbie Devizo, Dr. Devizo's ex-wife and former League of Freedom team member. DC ZOOM/DC INK: For a rundown of DC Zoom and DC Ink graphic novels for next year, with covers and artists' names, CLICK HERE. X-O'S AGENT: Valiant Entertainment has released cover art and details for "Agent," the arc of X-O Manowar running from #19-22. "Beyond time, space, and reality, there lies the Unknown...and now it's coming here! When soldiers from a mysterious foreign realm arrive on Earth, it's up to the armored Visigoth known as X-O Manowar -- newly returned to the planet and now the leader of his own elite G.A.T.E. unit -- to deal with the intrusion. But are these otherworldly emissaries truly the threat they appear to be, or does a larger danger loom over the Valiant Universe still?" X-O Manowar #19, in stores on Sept. 26, is written by Matt Kindt, with art by Juan Jose Ryp and covers by Kenneth Rocafort, Alan Quah, Mico Suayan, Renato Guedes, Mico Suayan and Whilce Portacio. FEAR'S RETURN: AMC has announced that the second half of Season 4 of Fear The Walking Dead will premiere on Sunday, August 12 at 9 p.m. (ET/PT). "The first half of season four began with one figure huddled around a campfire, and ended with nine. Characters who started their journeys in isolation collided with each other in unexpected ways and found themselves in one of the last places they ever expected to be...together. In the back half of the season they will explore who they are now -- as individuals and as part of the greater group -- and how they will forge ahead. They will find themselves pitted against new adversaries -- human, walker and even nature itself. Theirs will be a journey wrought with danger, love, heartbreak, loss, and ultimately, hope."